So recently I was playing battlefield 1 thinking about all the time I spend in loading screens, and wondered why no one (especially EA) hadnt tried to put adverts in. The business model would be simple, create a free to play well polished game with no in game purchases, but rather adverts to cover costs of development, servers and advertising. There is no questioning the idea would be financially viable as games like LOL (cancer I know) get about 3 million players a month and hundreds of thousands of concurrent players. A one minute advert break every 15 minutes would give similar advertising time to TV adverts which are very profitable. As well as this, gamers are a very specific audience (males aged 10-30 approx) AND there would be additional clickthrough revenue (not found on tv adverts) ultimately it would come down to whether or not people are willing to play a game with adverts in it but I believe that for a well polished modern warfare military shooter that was free it would be a no brainer, but that makes me wonder why it hasnt been done before if its such a great idea. Hmm I think this is what some Free-to-play games do, but can't recall if they are adverts about the game itself (e.g. "buy premium gold") or other adverts. Generally the ads are seen as an annoyance, partly because modern web ads are getting more intrusive all the time (e.g. popups, fullscreen ads, autoplaying videos). I am not an advertising guy so I can't tell if vanilla advertising with still-images and such is still effective. If we can assume game devs have power over decisions like this and they are committed to their game, I wonder if they even want to 'spoil' the game by having random ads in there. Not to mention it would likely serve as one more platform for borderline privacy breaking telemetry, since one of the profitable parts of ads is the tracking and information of the user. Thinking about it, yes games actually advertise their own products but that doesnt really discourage players. Privacy could be an issue but then again facebook have been selling user personalised ads for ages and mobile apps do the same so i doubt it would be an issue. When "Battlefield 3" first came out, I always found it weird how the advertisements plastered across Operation Metro were all made up. They could have been real ones instead and then there would be advertisement revenue for the game. Also, Siege of Shanghai in "Battlefield 4" featured quite a lot of this as well, with parodies of KFC quite prominently displayed around the map. Thinking about it, yes games actually advertise their own products but that doesnt really discourage players. 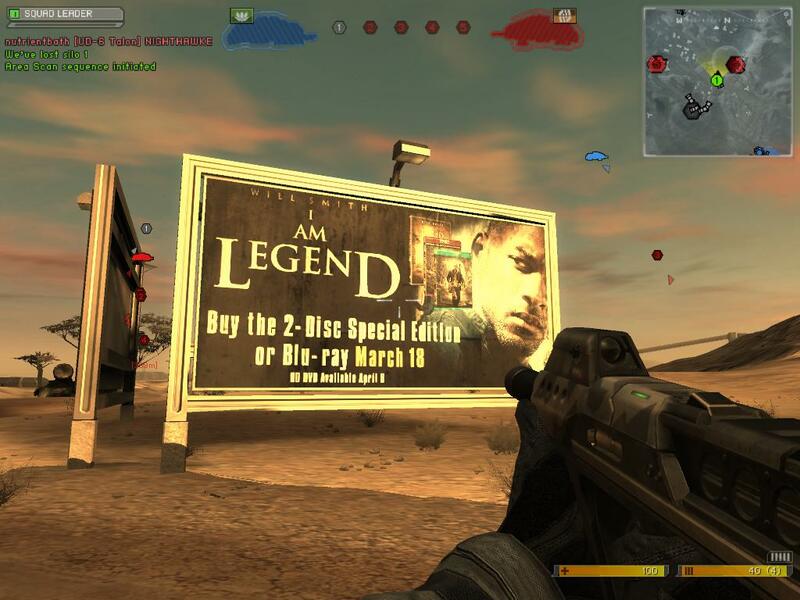 I am not sure if this was true, but I heard that the billboards on actual maps in "Battlefield 2142" changed right before the announcement for "Battlefield 3" to inform players of an upcoming game. Apparently it spooked quite a few people, as those billboards had fake advertisement before and never changed in years. It's funny you mentioned this, because you're only half-right. I suspect that Battlefield 2142 is too old for many of you to have played or remember, however the game shipped with an adservice system that was supposed to put up dynamic, real life ad content on billboards placed all around the urban portions of the game world. ie, 2142 did exactly what you suggest. You can find various screenshots and videos of the system in operation on Youtube, etc. People were furious because the system amounted to data-mining your PC to target ads specifically to you. Also, because they were profiting on the backs of gameplay hours in a game that was bought full retail. EA and a few big companies signed with IGA worldwide to integrate such ad service into various games. It's not surprising that people challenged if this was ethical or a legal practice - gregarious terms in software EULAs are generally thrown out in court under "non-standard" contract clauses in various laws. Both of the major players in delivering ad content to games (IGA and Double Fusion) folded within a few years of rolling out massive platforms with big publishers (they got big in 2008 and folded by 2012). The reason for failure are generally cited as finiancial - they required excessive external investment, and they were spread out far too thin between too many publishers and so their revenue was actually quite poor for the amount of work that needed to be done securing and then implementing ad service in games. I think it was other factors though: a lot of work to implement and a consumer litigation liability combined with overall poor revenues - video games are a poor venue for ads, especially since you can't or simply wont stop playing to click on a link and you wont be scanning any Q codes. The other problem is that they don't want to break immersion. You can't have ad service in a pre-digital age historical piece and even modern ads will break the immersion of futuristic settings. That limits the number of titles you can really mess around with the tech, and that limits revenue vs implementation costs. Basically it is too recent of a totally failed experiment for AAA titles to start messing around with ad service in game again. If they ever will. Some games already do this. It depends mostly on the genre of game and the intentions of the developer to be as close to life as possible. Project CARS for example is a simulator style racing game that uses laser-scanned track data to make the most accurate tracks possible. These tracks not only feel exactly how they should in real life, but they look like it too, using the same advertisements as the real track does. I took one lap around Road America and screenshotted all of the real-to-life ads they use. So now we have to ask where it is appropriate to place these ads. If they are used for the sake of authenticity, that is fine. However, it crosses the line when these advertisements start popping up in loading screens or in menus. I've paid for my game already, why would I like to see ad space being sold inside of it? Most people pay a premium to block ads, or use an ad blocking program like AdBlock Plus or uBlock Origin. I paid for Twitch Turbo until it was converted to Twitch Prime so that I could block ads without taking money away from the streamers I watch on Twitch. There's also the question of what the ads would do in places like loading screens. I would find it completely unacceptable if an advertisement in a loading screen increased my loading time. I bought an SSD to prevent that. Even before the ads get into the game there are licensing problems to deal with. Advertising deals are usually made on a contract. These contracts specify an amount of time that the ad will run before the space can be rented out again. How do you manage that in a game? Game servers can run for over a decade, surely those advertisements wouldn't be relevant to the product being promoted for that long. But what alternative would there be? Map designers and artists aren't going to constantly update maps and push patches just to keep up with current products. I don't think that placing advertisements in games is a good idea. There are too many variables to account for both on a logistical and legal level to make it feasible to rent space like that. This is really silly, but I wish "Battlefield 1" could somehow advertise the upcoming "Wonder Woman" movie next year. It could just be small paper posters around map with the picture of the titular character and asking if people have seen her. The reason I want it though is mostly because I enjoy DC Comics. Basically it is too recent of a totally failed experiment for AAA titles to start messing around with ad service in game again. I guess most people do not want to see something like this in their game ever again. Project CARS for example is a simulator style racing game that uses laser-scanned track data to make the most accurate tracks possible. These tracks not only feel exactly how they should in real life, but they look like it too, using the same advertisements as the real track does. Were either sides paid for this under some sort of contract by the way? Or did the developers just cite maintaining accuracy as the reason? The developer very likely paid a licensing fee to each of those brands. Usually whoever approaches the other party is the one who pays. If a business would like to advertise on a game, the business pays. If the game would like to use the brand in the game, the game pays. This is especially true of car brands in racing games. If the game would like to use the brand in the game, the game pays. Does this happen to be the reason as to why the recent "Battlefield" titles often use alternative names for the guns in the games? You will note that Bell Textron sued EA/DICE over use of the Venom, Cobra and Osprey in BF3/BF4. As with most cases of this type it was settled out of court after EA tried to have it thrown out on various grounds.